English "diamond king," promoter, and speculator; born in London July 5, 1852; committed suicide by jumping from the deck of the steamship "Scot," June 14, 1897. His father, Isaac Isaacs, was a small general dealer with a prosperous business. 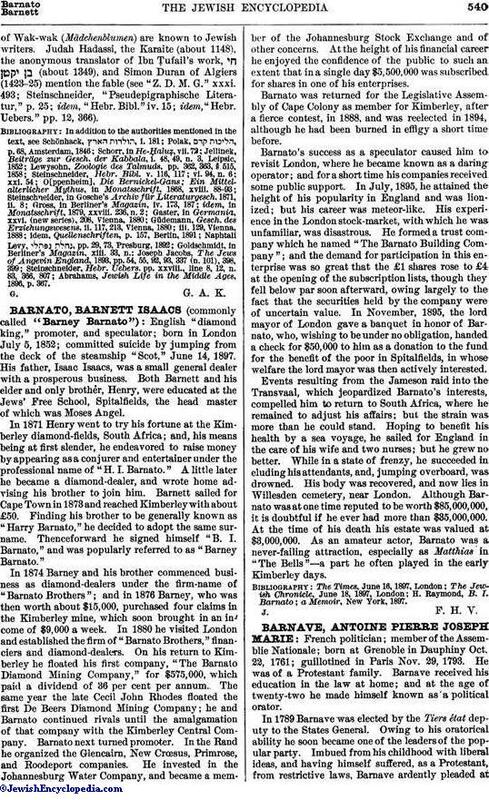 Both Barnett and his elder and only brother, Henry, were educated at the Jews' Free School, Spitalfields, the head master of which was Moses Angel. In 1871 Henry went to try his fortune at the Kimberley diamond-fields, South Africa; and, his means being at first slender, he endeavored to raise money by appearing as a conjurer and entertainer under the professional name of "H. I. Barnato." A little later he became a diamond-dealer, and wrote home advising his brother to join him. Barnett sailed for Cape Town in 1873 and reached Kimberley with about £50. Finding his brother to be generally known as "Harry Barnato," he decided to adopt the same surname. Thenceforward he signed himself "B. I. Barnato," and was popularly referred to as "Barney Barnato." In 1874 Barney and his brother commenced business as diamond-dealers under the firm-name of "Barnato Brothers"; and in 1876 Barney, who was then worth about $15,000, purchased four claims in the Kimberley mine, which soon brought in an income of $9,000 a week. In 1880 he visited London and established the firm of "Barnato Brothers," financiers and diamond-dealers. On his return to Kimberley he floated his first company, "The Barnato Diamond Mining Company," for $575,000, which paid a dividend of 36 per cent per annum. The same year the late Cecil John Rhodes floated the first De Beers Diamond Mining Company; he and Barnato continued rivals until the amalgamation of that company with the Kimberley Central Company. Barnato next turned promoter. In the Rand he organized the Glencairn, New Crœsus, Primrose, and Roodeport companies. He invested in the Johannesburg Water Company, and became a member of the Johannesburg Stock Exchange and of other concerns. At the height of his financial career he enjoyed the confidence of the public to such an extent that in a single day $5,500,000 was subscribed for shares in one of his enterprises. Barnato was returned for the Legislative Assembly of Cape Colony as member for Kimberley, after a fierce contest, in 1888, and was reelected in 1894, although he had been burned in effigy a short time before. Barnato's success as a speculator caused him to revisit London, where he became known as a daring operator; and for a short time his companies received some public support. In July, 1895, he attained the height of his popularity in England and was lionized; but his career was meteor-like. His experience in the London stock-market, with which he was unfamiliar, was disastrous. He formed a trust company which he named "The Barnato Building Company"; and the demand for participation in this enterprise was so great that the £1 shares rose to £4 at the opening of the subscription lists, though they fell below par soon afterward, owing largely to the fact that the securities held by the company were of uncertain value. In November, 1895, the lord mayor of London gave a banquet in honor of Barnato, who, wishing to be under no obligation, handed a check for $50,000 to him as a donation to the fund for the benefit of the poor in Spitalfields, in whose welfare the lord mayor was then actively interested. Events resulting from the Jameson raid into the Transvaal, which jeopardized Barnato's interests, compelled him to return to South Africa, where he remained to adjust his affairs; but the strain was more than he could stand. Hoping to benefit his health by a sea voyage, he sailed for England in the care of his wife and two nurses; but he grew no better. While in a state of frenzy, he succeeded in eluding his attendants, and, jumping overboard, was drowned. His body was recovered, and now lies in Willesden cemetery, near London. Although Barnato was at one time reputed to be worth $85,000,000, it is doubtful if he ever had more than $35,000,000. At the time of his death his estate was valued at $3,000,000. As an amateur actor, Barnato was a never-failing attraction, especially as Matthias in "The Bells"—a part he often played in the early Kimberley days. a Memoir, New York, 1897.